PROVIDENCE, R.I.--Senior Bogdana Mimic (Pancevo, Serbia) has been named the BIG EAST Female Cross Country Athlete of the Week for the period of September 26-October 2, the conference announced today. In her first race of the season Mimic was the individual champion of the Women's Gold race at the Paul Short Run last Friday morning. Mimic covered the 6K course at Lehigh in a time of 20:10 and won the race by nine seconds on a sunny and hot day. 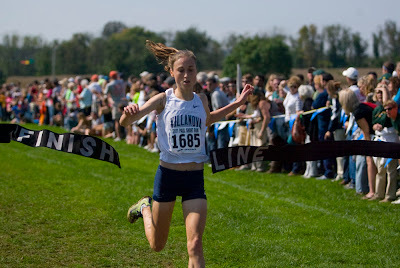 Her winning time was the second-fastest of her collegiate career on a 6K course and marked Mimic's first individual victory in cross country. Thanks to her first place finish Villanova placed second out of 45 teams in the Women's Gold race in the team's first scored meet of the season. The strong result helped the Wildcats move up one spot to No. 1 in this week's USTFCCCA Mid-Atlantic Region rankings, the first time this season that Villanova has reached the top spot. During her Wildcat cross country and track career Mimic is a four-time All-American, including twice in cross country (2009, 2010) while helping lead Villanova to national championships in each of the last two seasons. In cross country she is also a three-time All-BIG EAST and three-time All-Mid Atlantic Region selection.